Just like creating an album, it takes a lot of creativity and time to perfect your band’s website. But Jimdo helps make the process easier and quicker so you can spend more time writing your next hit. One of the most important aspects to your band’s website is of course, your music. Your music is likely on multiple platforms from SoundCloud to BandCamp to Spotify. You can upload music to your site however you prefer, but in this post we’ll focus on how to embed a Spotify playlist to your website. You should have a page of your website dedicated to sharing your band’s music. Most band websites simply call this page “Music.” You don’t have to put your music right on your homepage, but if you are promoting a new single or have a nice video of your band performing it can be a nice touch to add it there. Jimdo customer and ‘ukulele player Ben Ahn includes a video on his homepage and shares the rest of his music on a separate page of his site. To get started, go to the navigation bar on your homepage to create a new page. Title your page “Music” and click “Save.” Now, click on “Music” on your navigation bar to be directed to your new page. Use the up and down arrows to position the page where you want it to show up on the navigation bar. Your music speaks for itself. Save all the text and description about your band for your About page. If you have more than two albums you might want to create columns to keep your music clean and organized on your site. If you only have one or two albums you can fill up the rest of your page with images of your band. After you decide where to put your music, add a new Widget/HTML element to your site. Keep your site accessible while you head on over to Spotify. To get the code for your website simply click on the icon with the three dots “…” and choose Copy Embed Code. Return to your site and paste the code into the Widget/HTML element. Then click “Save.” That’s it! Repeat with as many other albums as you’d like. 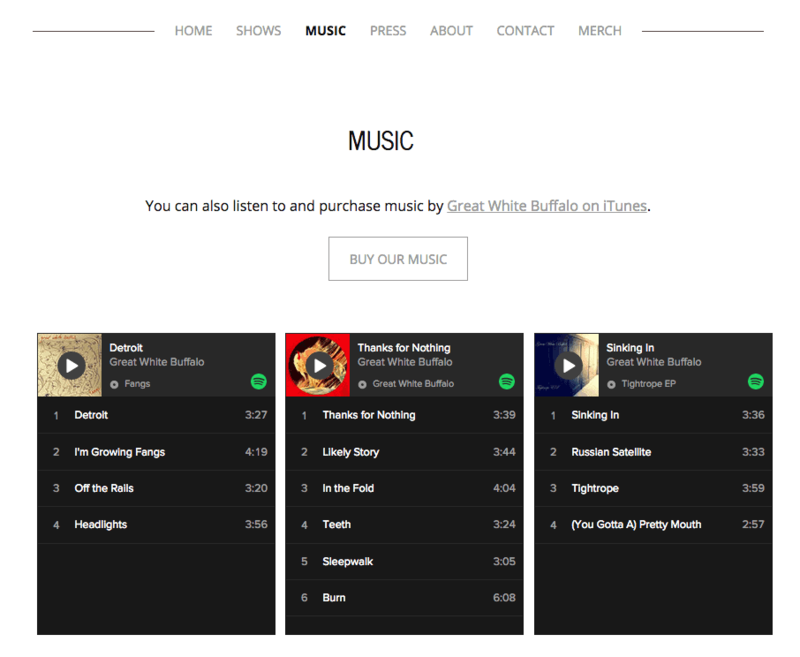 Here’s an example of how a Spotify widget will look as seen on Los Angeles band Great White Buffalo’s site. You can also copy the embed code for individual songs by clicking on the three dots icon “…”, which you can see by scrolling over songs on your Spotify playlist. This can be helpful if you want to promote one of your songs on your homepage. For even more information on adding music from Spotify on to your website check out Spotify’s support page. Also check for more tips on musician websites in our guide. That was easy, wasn’t it? Let us know if you have any questions in the comments.